According to the time zone, between 15th-16th October we will experience a very intense Super Moon at 23° Aries, while the Sun will be at 23° Libra. The term “Super Moon” appeared for the first time in an article written by the astrologer Richard Nolle in an Horoscope magazine in 1979, as he wanted to create an astrological term for what the astronomers technically call perigee-syzygy of the Earth-Moon-Sun system: “…a new or full moon which occurs with the Moon at or near (within 90% of) its closest approach to Earth in a given orbit (perigee). In short, Earth, Moon and Sun are all in a line, with Moon in its nearest approach to Earth.” This means that because of the Earth-Moon-Sun alignment the effect of the Full Moon on our life will be intensified through extreme and decisive crescendos and culminations of events. From the esoteric point of view the Sun sign indicates the present dilemma of man, the life tendencies that are seeking expression at this point in time; while the position of the Moon reveals that which is past, it summarizes the limitations and it shows where the prison of the soul is to be found. The Sun is in the green sign of Libra, which is the place where we are asked to reach a point of balance between the spiritual and personality aspects within us in order to achieve the reversal of the wheel and the beginning of a new orientation in life. 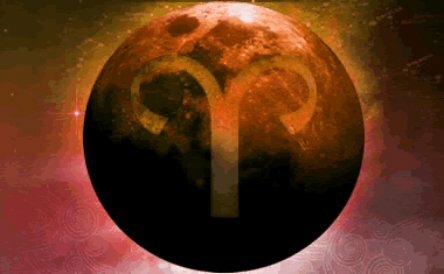 The Moon is in the red sign of Aries, which esoterically initiates the cycle of manifestation of spiritual ideas and which forces the soul into a purifying process. Libra and Aries are the two star signs ruling the two equinoxes. The Spring Equinox is about resurrection and reintegration, while the Autumn Equinox is about the Descent into the Darkness/subconscious mind. They represent a dance between the Light and the Darkness in order to attain spiritual awakening, highlighting the fact that the darkness that we have been experiencing in the recent past was absolutely necessary for our own growth, as without darkness we would not know light, because it is only by meeting the darkness of our subconscious that the light of the soul may emerge to our conscious mind. 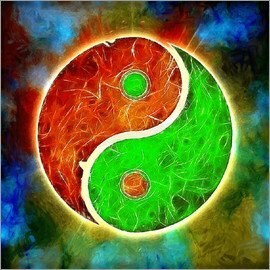 Green and Red are the two ancient colours related to the Dao, expressing the complementary and opposing forces of Yin and Yang, darkness and light. Red is energy, mental re-evaluation and the awakening force, green is decision making, heart and direction. Both green and red come from the two primary primaries, blue and yellow: red comes from blue and yellow as light, while green comes from blue and yellow as pigment. 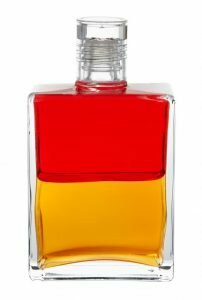 As described in the previous blog, blue and yellow are associated to the Aura-Soma® Equilibrium bottle Anubis, the esoteric Tarot card Justice and karmic alignment, which are all related to Libra and very strongly involved into this Full Moon scenario. The Sabian symbol of the Sun is “a butterfly with a thrid wing on its left side“. The butterfly is a spiritual symbol for rebirth and the third wing refers to the ability to develop a new spiritual heart-based mode of response to the different life situations. It is about mutation and a change of attitude. The Sabian symbol of the Moon talks about the openness of the personality to the influx of spiritual energies: “blown inward by the wind, the curtains of an open window take the shape of cornucopia”. As Dane Rudhyar states, the cornucopian shape of the curtains indicates the fact that the mind has not only opened up to personal growth but that it has softened to such a point that it can be “molded by transpersonal forces“. Libra, the sign where we find the Sun, transmits the energy of the Third Ray of Active Intelligence, which is the will of conditioned purpose, meaning that all events and situations are carried forward of the Divine Plan intelligently conceived for our spiritual evolution. Aries, the zodiac sign where the Moon is located, vehicles the energy of the First Ray of Will/Power, the “Divine incentive”, the seed that destroys all forms in order to manifest its spiritual intent. This means that the past is going to go through a process of destruction at some level for a new seed to be born. The rulers of Aries are: Mars, on the Mutable Cross, Mercury on the Fixed Cross and Uranus on the Cardinal Cross. The interesting aspect is that all these three planets will be directly involved in the celestial configuration of this Super Full Moon: Mars at 12° Capricorn, conjunct to Pluto, will be squared both to the Moon conjunct to Uranus and Eris in Aries and to the Sun conjunct Mercury in Libra, creating a T-square in the sky, expression of a lot of struggles but also of action and the drive necessary to succeed and achieve resolution. Mars, which in the T-Square aspect pattern will be the planet with the two squares to it, will become the focal planet, or action point, and all the energy will be generated and activated by its influence. Mars embodies the Sixth Ray force of Idealism and Devotion. We are driven by what we are devoted to within ourselves. The fact that the Moon, expression of the past and the prison of the soul, is in Aries, shows us that we are still carrying out God’s idea in the old way of the personality and that a new seed is about to sprout and destroy the old. Mars in Capricorn is about the transmutation of the personality ideas and ambitious worldly projects into a higher aspect in order to work out God’s Plans and make them our own. The conjunction between Mars and Pluto will strengthen our “commitment to act upon our needs for transformation, to incorporate the higher levels of consciousness into our very being, knowing that all desires and attachments will have to be brought to the surface and purged and that all our true motives will have to be faced” – (Stephen Arroyo). In the Aura-Soma® colour-care system Mars is associated to the Equilibrium bottle B40, known as The “I Am” bottle, red over gold. It is about the integration of our Divine and Human “I Am” so that we may awaken (red) to the star that we are (gold). It is the possibility to discriminate and understand what our soul has come here for. Being the Messenger of the Gods, Mercury, which embodies the energy of the Fourth Ray of Harmony through Conflict, will create the necessary inner and outer conflicts to illumine the mind and allow the communication between the personality and soul in order to dispel the illusions of the intellect. Uranus, supported by the power of the dwarf planet Eris, the Goddess of Discord, will trigger the friction and the electric fire to fuse Spirit and matter, soul and personality and allow the manifestation of the Spiritual Plan in our daily life. The Moon will be conjunct to two Fixed Stars: Baten Kaitos in the Whale or Cetus constellation and Acamar in the Eridanus constellation. Symbolically the whale asks us to listen to our inner voice and follow our own truth; the whale forces us to examine where we are, what has brought us to this point in order to get in touch with the true reality about ourselves; it is about emotional rebirth. Baten Kaitos in the belly of the Whale is associated with the legend of Jonah. Jonah was a prophet who was commanded by God to go to the city of Nineveh to prophesy against it “for their great wickedness is come up before me” (Jonah 1:2), but he fled from the presence of the Lord and went to another town in the opposite direction. During a sea storm he was miraculously saved by being swallowed by a whale in whose belly he spent three days and nights praying to God and asking to paying what he had vowed. The womb is symbolic of the inner work of alchemy of death and rebirth. It is the entrance into the darkness of the subconscious in order to experience the death of the personality and the creation of the imperishability of Spirit for our own resurrection. Acamar comes from the Arabic Al Ahir al Nahr, meaning “the End of the River”, referring to the end of the celestial river Eridanus, also known as the river Padus or Po in connection with the myth related to the death of Phaeton. The river is a symbol frequently associated to the stargate theme and it appears in the world’s sacred traditions as a symbol of divine influence and of life’s interdependence. It metaphorically depicts a cascade of spiritual-intellectual energies flowing from the cosmic planes into the individual life linking it intimately with the highest spiritual source. For this reason Acamar is associated to changes, which are Divinely driven in order to align us to our true spiritual nature. According to the Kabbalistic tradition, the Hebrew letter Hei created Aries. Hei means “Window” and it refers to the Divine Breath, which can give us the strength to be born again. 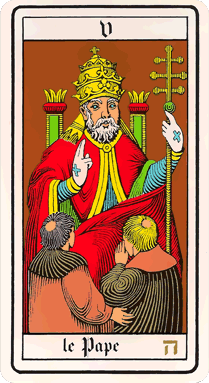 It is associated to the Tarot card The Pope, esoterically known as “The Blessing”. This card is asking us to look beyond the outer form and see the energy of love and truth behind all things. It is about the recognition of and the service to the God within as the Divine flash hits the heart and allows the fusion with the light. It is the completion of the Road to Damascus experience for the alignment of the personality to the soul and the freedom from the slavery to our urges, drives and fears. It is about sacrificing the lamb (Aries, the ram) of the past for the Christic consciousness to be born. This Super Full Moon will activate a “crisis of the birth hour”, where we will be offered the possibility to pass through the burning ground to liberation from what we have been holding us back or not allowing us to be truthful to ourselves. It is the beginning of the period where the soul changes its direction and its purpose and it finally enters a process of spiritual regeneration and initiation.